Puerto Rico vacation is filled with the beauty of white sand beaches, endless coastlines, old colonial architectures, churches and museums. An abundance of accommodation options with majestic scenery, and the top notch amenities are at your service, the only thing left to do is choose what best suits your budget and preferences. Puerto Rico, a dependant territory of the United States of America, has so much to offer even to the pickiest traveller. Fantastically gorgeous scenery no matter where you are on the island, a vast variety of activities and attractions and the best picturesque beaches throughout make Puerto Rico vacation a dream come true. Why vacation in Puerto Rico? Puerto Rico vacation is not your typical beach vacation and offers a lot more than that regular all-inclusive Caribbean fun. There is so much to do and to see, so many new places to explore that you will be busy throughout the entire time discovering the unique treasures of this island. Puerto Rico, with a rich heritage and its spectacular Caribbean setting, offers you countless opportunities to see local historical buildings, monuments, museums, galleries and a choice between many historical city tours. 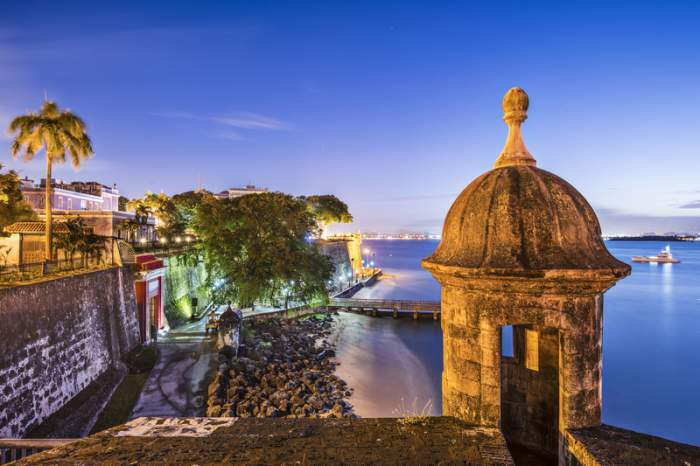 Take a stroll through the Old San Juan or check out San Juan National Historic Site to get a glimpse into the island's ancient times, where the town, with a strong culture influenced by Taíno, African, and Spanish descendants will take you a few centuries back. No matter where go on Puerto Rico vacation, a shopping mall is always within reach, so those A-class shoppers will go wild for the vast selection of fabulous stores offering the best quality goods and merchandise. 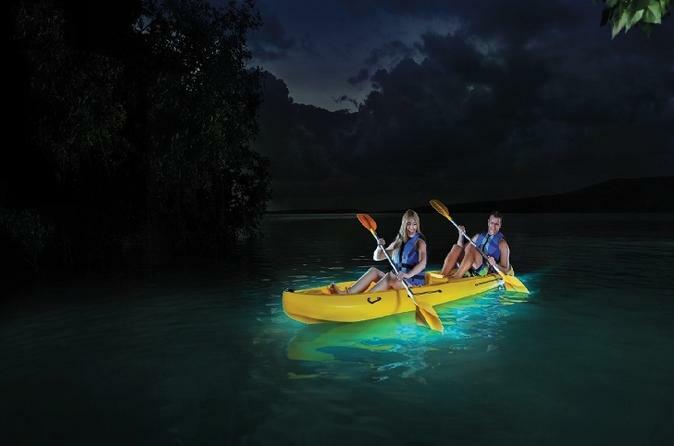 Bioluminescent Mosquito Bay is one of the top attractions in Puerto Rico, located near Vieques island. And even if you are not into travelling outside of your resort, take your time and pay a visit here. Trips are offered during the dark evening hours only, and this Bioluminescent Bay is considered as one of the most spectacular sites in Puerto Rico. Once you glide through the bay you will be amazed at the thousands of tiny star-like bioluminescent organisms brightly glowing in the dark. This rare phenomenon of nature is the only one of its kind in the entire world, so once you are here, do not leave without visiting this Mosquito Bay. Along with enjoying that warm local atmosphere, there is always a lot to accomplish. Join a tour of the Casa Bacardi-Rum Factory, visit the Cathedral of San Juan Bautista, the Parque las Palomas - Pigeon Park or Caparra Ruins - Museo Ruinas de Caparra, or simply engage in some of the most exciting water sports like surfing, fishing, cruises, boat tours, diving, snorkeling or seaplane flights, there is always something to do for everyone during Puerto Rico vacation. While there is plenty to do during the day, there is also quite a few places to check out when the sun goes down. 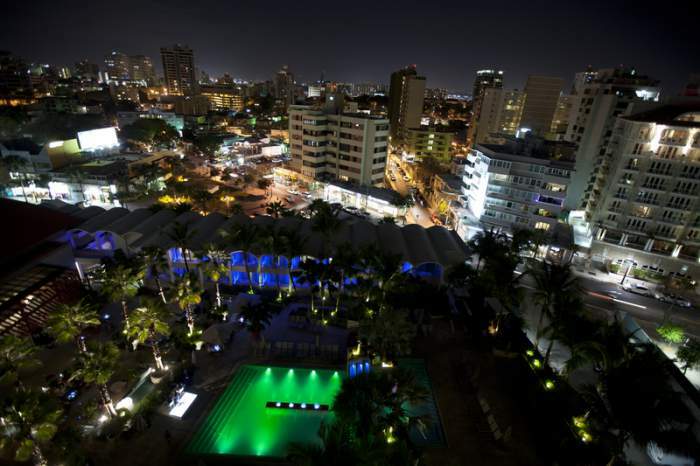 Nightlife lovers will have a great time at San Juan's dance clubs, or, if you are not into dancing, casinos located at some of the major hotel chains are open late welcoming you to the world of games and fun. All that and a lot more is waiting to be discovered by you on your Puerto Rico vacation. So hop on a plane and be on your way to the world of magic, sun and excitement! Explore San Juan National Historic Site, El Yunque National Forest, and La Fortaleza, engage in a number of water activities, take a romantic Horseback Riding trip or one of the hiking adventures, where the mountains offer a number of routes of many difficulty levels. Ride a zipline over a high forest canopy to admire the view from up above, or hop on a 4WD and explore the off-road trails. These amazing attractions and things to do on Puerto Rico vacation will all capture your heart, while the traditional Puerto Rican cuisine with a slight touch of international ingredients will have your taste buds asking for more. Your next visit to this fantastic, blooming with life Caribbean island will be the one to remember for life! Puerto Rico's moderate and stable annual weather is perfect to enjoy your vacation any time of the year. Take some things into the consideration when making a decision of when to go on Puerto Rico vacation, because it all depends on your budget and what you are looking to do while visiting. High season from December to April is quite expensive, no wonder a lot of tourists say San Juan in particular is overpriced during the winter months. But the weather is pleasant, no chances of precipitation and with thorough planning you may even uncover some good discounts. The best time to go to on Puerto Rico vacation is from mid April to June. This is when all the crowds have gone back home, the island is quieter, the weather is still gorgeous, hot, enjoyable and with no humidity and the off-season's thunderstorms are long way to come. The weather during the spring months stays in the high 20s degrees Celsius (high 80s degrees Fahrenheit) and the accommodation rates are extremely low. This is the best time to enjoy the island and save a few bucks on your lodging. Where is Puerto Rico on the map? Puerto Rico is quite large in size and accommodates almost 4 million residents. Being 177 km (110 miles) long and 56 km (35 miles) wide, it is the third largest island under the U.S. jurisdiction. Its total land area is 13,791 square kilometres and houses several separate vacation spots as well as the off-shore Puerto Rican islands like Vieques and Culebra. Puerto Rico is washed up by the waters of the Caribbean sea and North Atlantic ocean and is the most eastern island of the Greater Antilles group. 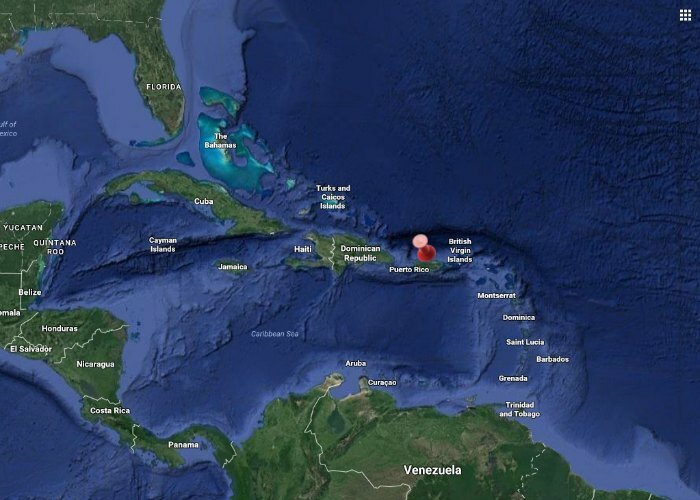 It is situated 381 km (237 miles)southeast of Dominican Republic, 207 km (129 miles) east of British Virgin Islands and only 179 km (111 miles) northeast of U.S. Virgin Islands. San Juan, the capital of Puerto Rico, is considered to be the second oldest European-established city in the Caribbean after Santo Domingo, Dominican Republic. It is also the largest city in Puerto Rico, with population at approximately 395,326 residents. San Juan is a vibrant city with pulsating energy that just sizzles with exotic sites and surreal surroundings. Old San Juan contains 400 historical buildings, as well as preserved examples of 16th-17th century Spanish colonial architecture. There are a ton of places to discover here on your Puerto Rico vacation, a lot of history to learn. 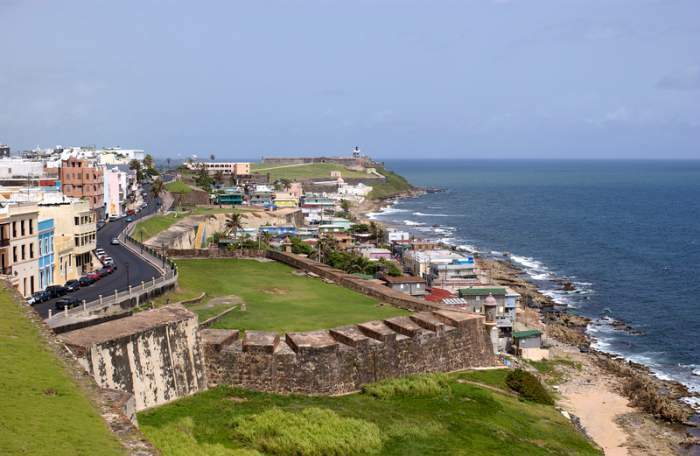 Visit La Fortaleza, Paseo de la Princesa, Alcaldia - the local city hall, Museo de la Americas, numerous stunning architecture buildings, memorable and scenic views and blooming parks, ideal for bird and people watching. Water sports are another big draw that attracts tourists to San Juan. The velvety-sand beaches with turquoise crystalline waters make water activities a hit. Scuba diving, snorkeling at some of the world's most remarkable reefs, discovering the marine life and the underwater world will leave an unforgettable impression of your Puerto Rico vacation. As per national U.S. statistics, the population of Puerto Rico in 2016 is at 3,988,905 residents. Due to high immigration rates, the population of the island has declined over the course of previous years, and experts believe that if it will continue to drop down at the anticipated rates, in about 30 years the numbers can even be below 3 million. The majority of Puerto Ricans are Hispanics and their predominant religion is Roman Catholicism. The island's total population mostly consists of latinos and hispanics; however, white people of Spanish origin are also the biggest race group that live in Puerto Rico. Approximately 8% of black inhabitants and a small percentage of Asian residents also reside here, while other mixed ethnicities including Jews, Muslims and Hindus live in their own small communities within the island. Puerto Ricans, some of the nicest and most sociable folks in the Caribbean. They will provide their assistance to anyone who asks for help and although their top notch service does not depend on it, learning a few words en Español will get you a long way and will result in an even better Puerto Rico vacation. Both Spanish and English are the official languages of Puerto Rico; however, Spanish is the dominant of the two and is used in business, government, educational and daily life dealings. Although Puerto Rico is a dependant territory of the United States, residents that live in regions far away from tourist concentrated areas speak very little or no English at all. Those that are directly or indirectly involved in the tourism industry or live near the large cities and towns that tourists visit, do speak and understand English, most of them quite well. When speaking English to a local during your Puerto Rico vacation, slow down, as they might not be able to catch on the phrases quickly, but if you invest a few bucks in the English-Spanish dictionary it might do the trick in having a warm conversation. Baseball is taken very seriously in Puerto Rico, so this is another great way to strike up a talk with a local, as it is one of the topics they are erudite and knowledgeable in and respect those who share their love for baseball. San Juan's Aeropuerto Internacional Luis Munoz Marin is the major regional hub and many travellers make their connections to other Caribbean islands here. This airport links islands like Antigua & Barbuda, Dominica, St. Vincent, Dominican Republic and others. If you are looking to travel further to Puerto Rico's offshore islands Vieques or Culebra, this airport offers domestic flights that will take you to your Puerto Rico vacation in no time. This fairly large and fully equipped international air terminal welcomes daily nonstop flights from major American and Canadian airlines daily. Nonstop flights that connect Puerto Rico with United States and Canada are available from a number of North American cities like Chicago, Dallas, Miami, New York, Atlanta, Boston, Fort Lauderdale, Hartford, Newark, Orlando, Houston, Philadelphia, Baltimore, Washington, Charlotte and Toronto. Although there are no nonstop trips offered from Montreal, direct flights are available. However, the best way to save on your ticket fare is to catch a nonstop flight from some of the major cities in United States. British Airways was the only European airline that offered direct flights to Puerto Rico with a transit stop in Antigua & Barbuda. However, recently it ceased its operation to the island, so if you are a European passenger, the best way to get to the Puerto Rico is to catch a flight directly from the United States. San Juan's other airport Aeropuerto Fernando L. Ribas Dominicci (also known as La Isla Grande) is located in Miramar, a district in the municipality of San Juan. It is a small facility that offers short flights to Vieques, Culebra and other nearby islands. Puerto Rico is an archipelago with offshore islands and cays, so taking a ferry is a great way to go island hopping to get a more intimate experience exploring the country. Fajardo that is about a 50 minute drive from San Juan offers passenger and cargo ferries to Vieques and Culebra, but seating is limited, so arrive there with plenty of time in reserve to avoid trip delays. The Fajardo ferry terminal gets overwhelmed with crowds especially on the weekends and during the holidays, so make sure to arrive early to purchase your tickets. Along with ferries to Culebra and Vieques, daily trips are also available along the shores of Puerto Rico . Car rentals are not allowed on the ferries and must be parked at the ferry terminal prior to you starting your trip. San Juan is the center of all the nightlife, shopping, fine dining and the island's best beaches, so if you are searching for a more fun and lively Puerto Rico vacation experience, this is the place to stay. 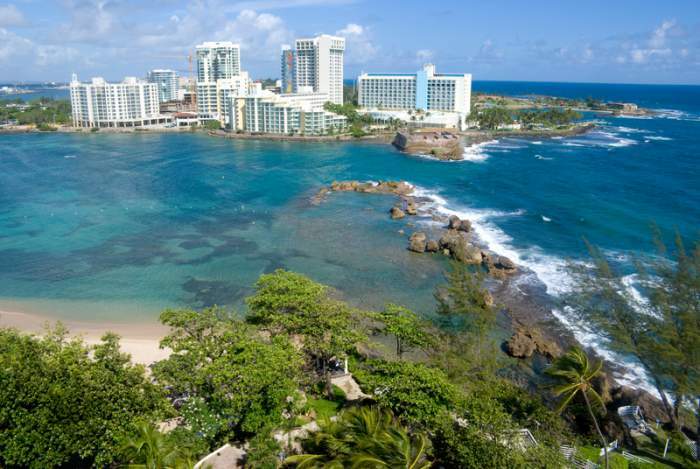 San Juan's beaches are lined with the most deluxe resorts with big casinos and nightlife. Many of them are spread along Isla Verde and Condado beaches. Here, in this true paradise, you won't find all-inclusive spots but there are plenty of large chain hotels and resorts, smaller inns, bed and breakfast options, vacation houses and suites for rent, cottages and even camping sites. The choice is yours depending on your preference of location and amenities offered. Most large and exclusive resorts are situated along Puerto Rico's northern coast, although you will find pretty amazing places in the southern part of the island as well. Other Puerto Rico vacation spots such as Ponce, Vieques, Rio Grande, Luquillo, Fajardo, Rincon, Aguadilla and Dorado all have an abundance of lavish accommodation options such as hotels, resorts and small inns offering home-style mouthwatering meals. However they are more about isolation and tranquility rather than fast-paced San Juan's life, so if you are up for a peaceful and laid-back time with all the best amenities, you will find plenty of lodging here. 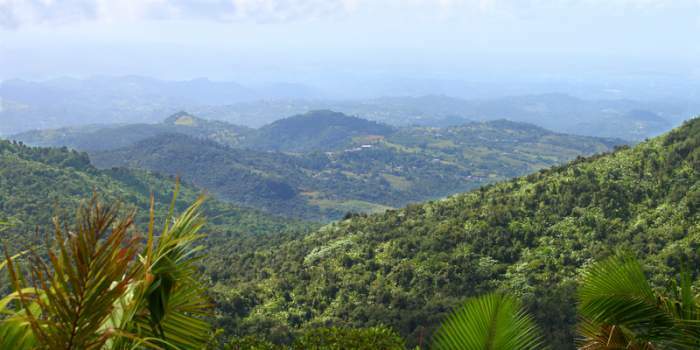 Puerto Rico is located in the heart of the tropics and never has drastic changes in weather. However, slight temperature variation will occur in some parts of the country, so it all depends on which side of the island you plan to be on your Puerto Rico vacation. Nonetheless, no matter what the weather is, like it is guaranteed to be a beautiful day out. Normally the weather changes according to the regions of Puerto Rico, and if it is a regular day, the eastern part of the island's temperatures can raise up to 31 degrees Celsius (88 degrees Fahrenheit), with light trade winds and no humidity. Southern part, where Ponce is located, is a dry desert terrain. It becomes quite hot at 34 degrees Celsius (94 degrees Fahrenheit). During the island's high season that runs from December to April, the temperature is around 28-29 degrees Celsius (83-85 degrees Fahrenheit), with January being the coldest month at 28 degrees celsius (83 degrees Fahrenheit). This is the best time to enjoy a Puerto Rico vacation if you want to capture moderately warm and lovely weather. Off season begins in Puerto Rico in the middle of April with sunny weather, and lasts all the way through mid-December. Temperatures during this time jump to 31 degrees Celsius (87-88 degrees Fahrenheit) and the weather is hot and humid. This is the time when the island is in its Atlantic hurricane season. Although hurricanes are a rare occurrence here, rainfalls, showers and thunderstorms are frequent visitors. August is the best month to enjoy the warm sea water and November is the wettest out of the entire year. Public transportation in Puerto Rico is a safe and quite affordable way to move across the major cities. Renting a car in San Juan is also an option but is not suggested to do in the metro area of the capital, as locals drive furiously and aggressively on the roads. Nevertheless, if you are confident to get behind a wheel in the downtown core, rent a car and start exploring on your Puerto Rico vacation. Carros públicos are public minibuses that run long distances between all major cities in Puerto Rico and are a hassle-free alternative way to driving. These minivans normally operate from early morning to late evening hours with no service at night. Major público terminals are all located near the center of mid-size and major cities, their destinations are visible in their front windows and you may inquire about their fares and schedules at the terminal as well. Although riding a minibus is great if travelling in between cities and towns, it can get cramped, hot and uncomfortable as the drivers try to take as many passengers as possible. Público vans stop practically anywhere where there is a passenger waiting, so getting to your destination might take a long time. The Metropolitan Bus Authority operates in San Juan metro area. Its buses run through the capital city and are the most inexpensive way to get around. If this is your only means of transportation during your Puerto Rico vacation, carefully review their schedules on the designated stops that are marked with magenta, white and orange signs with the Spanish word PARADA. Plan your trip accordingly with some extra time in the reserve in case rush hour delays the buses. The Puerto Rico Tourism Company has created a well-organized taxi program. White taxis with the "taxi turistico" logos run all around the city of San Juan, the port and the beaches, and have fixed "zone" rates. Taxis that have alternative routes in and outside of the city are metered. But before starting your trip, tell the cab driver to start a meter for you, many of them struggle to agree on that. Taxis can be hailed down either on the streets or simply by ordering one from your hotel or resort. In some countries hitchhiking is a safe way to hop from one place to another without the need to wait for the public bus or pay expensive taxi fares, but it is strongly not recommended in Puerto Rico. Use one of the safe transportation methods offered to avoid problems during your Puerto Rico vacation. Renting a car in Puerto Rico is a great experience that will let you explore all the beautiful places tucked away in the most precious Caribbean spots in the comfort of your car. However, exploring San Juan by car could bring both inconvenience and trouble as the city is busy, crowded and the drivers are irresponsible and aggressive on the roads. They cut you off, pull in front of you or may just stop in the middle of the road. Be extra cautious and always keep an eye of what is going around you. Exploring Sun Juan by car might not be worth the hassle, but renting a vehicle to see some of the other amazing places on your Puerto Rico vacation is a great idea, and the trip might only take 2 weeks to travel through the entire country. Driving in Puerto Rico is on the right-hand side, and a driver's license from your home country and a minimum age of 23 is all you will need in order to qualify to rent a car. Driving distances are posted in kilometres, speed limits are posted in miles and road signs are all in Spanish. The speed limits in the cities are 25 mph (40 kph), 45 mph on country roads (72 kph) and 55-65 mph (89-105 kph) on the highways. Occasional toll roads will require payments, and although they are cheap, your best bet would be to carry change in coins with you. Puerto Rico's road rules is something to take into consideration as well, as the roads and signs are different in many places, unpredictable and may even change without notice as you drive. Navigation doesn't always tell you the right way and flat tires seems to be the biggest problem in Puerto Rico. If you require roadside assistance, a Spanish dictionary is a good idea, since rental car agencies' representatives that come out to help at times do not speak English well. Most traffic starts in and just outside of major cities, so if you want to avoid being stuck on the roads for too long, avoid these areas during rush hours. Always remember, if you use a freeway in Puerto Rico, the left lanes are not for passing. In fact, no matter how fast you are driving you may stay on any lane of your choice. You may only switch lanes if you are passing a car, and if you are not, just stay behind even if the car in front of you is moving slow. For many years, Puerto Rico, a former colony of Spain, was relying on pesos as their only currency. It wasn't until 1913, when it became a Commonwealth country of the United States, the American dollar was integrated and became the country's national currency. The US dollars are often referred to as "pesos" in Puerto Rico, so do not be confused if your total at a restaurant or a supermarket comes in pesos, the currencies have the same meaning and value, but just get called differently by the locals. Major credit cards are widely accepted in Puerto Rico and ATM machines are accessible in all but rural areas of the island. If you haven't exchanged your money prior to coming for your Puerto Rico vacation, visit one of the nearby banks and they will gladly perform the transaction for you. Tips in Puerto Rico are expected and definitely appreciated, so if you received great service and your stay was enjoyable, be generous. In addition to a standard 5%-12% service charge many accommodations apply taxes. Those resorts that have casinos will throw in an extra 11% tax, those that do not will charge 9% on top of the final bill, and depending on the hotel or resort the extra taxes can even add up to 20%. The sales tax in Puerto Rico is set at 7%, so keep that in mind when purchasing goods. Normally restaurants, hotels and other establishments add a service charge to all of their bills and invoices, so inspect the bill carefully before making a payment during your Puerto Rico vacation. If the automatic charge is not included, leave anywhere between 15%-20% on top of the final bill. If you are extremely satisfied with the services rendered, extra tipping is at your discretion, just try to pay the service staff directly in cash to make sure they get the full amount of gratuity. Hotel/airport porters and shuttle drivers or anyone who helps you with your luggage receive $1-$2 per each bag they help you carry. The maids get $1-$2 per each day you stay at the hotel and taxi drivers expect a tip of 15%-18% from the total trip fare. Beach attendants and bartenders do not expect specific tips, but to show your appreciation, tip them $1-$2 each time a service is provided, acknowledge them for their attentiveness and willing to make your Puerto Rico vacation pleasurable. While some Caribbean islands may get bothered by pushy vendors, Puerto Rico is the exception. Tourists should rest assured they may travel throughout the island in peace and quiet and they will not get approached by vendors insisting to purchase their merchandise. In the event someone does decide to offer you their products, if you are not interested firmly say "No thank you" and move on. Although, Puerto Rico is facing high unemployment rate and financial crisis, the residents here are friendly, welcoming, will not harass the tourists and are always ready to help. Travellers on Puerto Rico vacation may freely move across the island, but if in downtown core, should watch for smugglers and petty cash thieves, which could be a frequent occurrence in the busy and crowded areas of downtown San Juan. Puerto Rico is a safe and a fun Caribbean destination. Safety in Puerto Rico depends on where you go, which places you visit and what neighbourhoods you stroll through. Just like in any other country, there are areas that should be avoided due to a high crime rate between the locals, such as Puerta de Tierra in the eastern part of San Juan, public housing areas, especially San Juan's Louis Lloren Torres, San Juan's Metro area and beach coastlines at night. Wandering into the unknown parts of the island especially alone might also bring you trouble, so explore only areas that are populated and popular among the tourists. In order to have a safe and sound Puerto Rico vacation, exercise safety precautions just like anywhere else in the world whether at home or travelling. All the tourists spots like resorts and hotels, tourist markets, shops and restaurants, excursions and trips are safe, and for extra security are patrolled by the police. If you intend to bring valuables with you on the trip, gently store them in the hotel's safe or security box, but do not leave any of your property unattended either on the beach, in the restaurant or in the car, always keep them with you. Continuous sun exposure throughout the day might cause a heat stroke or sun burns, so protect yourself accordingly with sunscreens and after sun lotions and always stay hydrated. These are simple yet very important rules to a worry-free enjoyable Puerto Rico vacation! Can you drink water in Puerto Rico? Water in Puerto Rico is treated and purified in the exact same way as in the United States, so it is absolutely safe to drink. A lot of travellers prefer to drink local tap water as it is pure, fresh, clean, very tasty and you can spend that extra buck or two on a treat or a locally made mouthwatering cocktail. If you have a sensitive stomach or want to avoid tap water altogether, opt in for drinking regular bottled or even mineral water that is widely available in stores, restaurants and supermarkets across the country. Electrical sockets in Puerto Rico supply electricity with 110-120 volts and 60 cycles, just like in the United States and Canada. If your are travelling from either country, you will not need voltage adaptors. Bring the chargers and plug your devices into Puerto Rican's electric network. Visitors coming from Europe will need transformers/converters and adaptors in order to use their appliances and devices during Puerto Rico vacation.